If you’ve had chickenpox, you face the possibility of getting shingles. Shingles are a painful, blistering rash on your skin that can happen on most any part of your body. The risk of getting shingles increases as you get older. Chickenpox and shingles are caused by a virus belonging to the herpesvirus family. After you’ve recovered from chickenpox, the virus can remain dormant in the roots of your nerves. While contracting chickenpox is a natural event for a child, activation of the virus as shingles is not. When your immune system is weakened, the shingles rash will begin to appear. Poor nutrition, chemicals, toxins, and emotional stress allow herpesvirus to appear as shingles (or any other type of herpes outbreak). Steroids, chemotherapy, and radiation can also trigger outbreaks because they damage the immune system. If you’re like most of us, you’ve seen grocery stores like Safeway and big chain pharmacies like Walgreens offering a shingles vaccine. Print and TV are saturated with warnings to get vaccinated. According to the only study published by Merck, those who were injected with the vaccine manifest shingles 2% of the time in a 3 year period. The control group had shingles 3% of the time. Leave it to slick marketers to call this a 50% improvement! Looks like a 1% improvement to me which is not very impressive. Always remember that vaccines contain poisons that you are injecting into your body. They are not made of natural substances. Your body is not engineered for vaccines. They can create adverse effects, some of which science is just now starting to understand. Some of the most common side effects of the shingles vaccine include headaches, fever, shock, joint and muscle pain, swollen glands, respiratory issues, and pain and swelling at the injection site. I have seen this many times in my patients. Keep your body strong and you do not need vaccines. Health is all about having a strong immune system to combat invaders. The most important thing to do is eat healthy Paleo foods and avoid sugar. We know from the 1940’s that people who ate the least amount of sugar had the lowest chance of getting Polio. Sugar weakens the immune system and can lead to viral infections and reactivations. Additionally, heavy metals such as lead and mercury, household and personal care products containing chemicals, and pollution will radically increase your risk of infections and cancer. Lastly, stress/anxiety/depression lead to poor sleep and hormonal chaos, setting the stage for things like shingles. 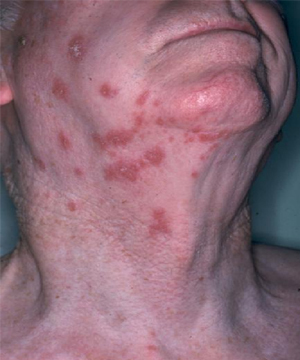 Prescription and OTC treatments are often used during outbreaks of shingles. Many physicians recommend prescriptions to alleviate the itching and discomfort. I don’t want you to use prescription or over-the-counter medicines to treat shingles. They often have adverse impacts on your overall health, impacts much worse than shingles. High quality raw honey is great for treating the itching caused by shingles. It draws fluid away from the impacted area and its high concentration of natural sugars restricts the growth of harmful microorganisms. Apply high quality raw honey directly to the affected area. Do this 4-6 times a day, with the goal being to keep the area always covered in honey. Aloe vera, garlic, lemon balm, vitamin C and lysine have also proved useful in combatting the discomfort caused by shingles. As soon as you feel symptoms, check with your doctor and load up on these nutrients immediately. Chiropractic care can also help with shingles. The spinal column is the home to the shingles virus. Spinal misalignment is a prime factor in the outbreak of shingles. Adjustments done by a chiropractor may prevent the outbreak of shingles and will most definitely aid in the recovery process. Taking a cool bath. Not too cold, as cold water could trigger another reaction. You simply want to soak in cool water to sooth the skin while relieving the itching sensation. Apply a wet compress to the affected areas. This works in much the same way as the cool bath. I want you to live a full healthy life. To do that, you need to avoid toxic chemicals like those found in the shingles vaccine. Take actions to boost your immune system, manage stress, and if you face an outbreak of shingles, treat it naturally. You’ll feel better, both now and in the future!